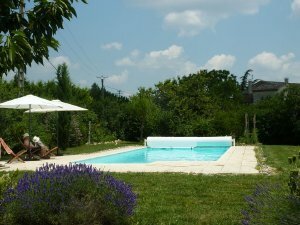 Stone Barn that sleeps 8 with 3-bedrooms, 2-bathrooms between Cordes-sur-Ciel and Albi, France. 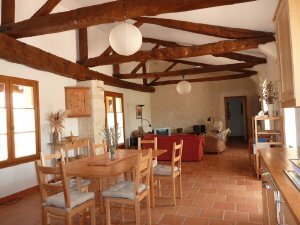 The Barn, which is attached to a stone farmhouse, has 3 bedrooms, 2 bathrooms and sleeps 8. 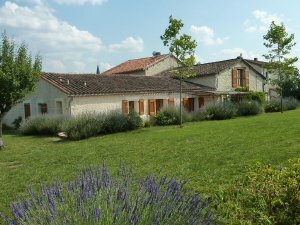 For larger groups the Barn and the attached stone house can be rented together-(see below) to accommodate up to 14 people with 6 bedrooms and 4 bathrooms. 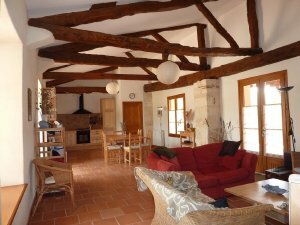 The barn comprises a large main room (12 x 5 meters) with sitting, dining and kitchen areas. 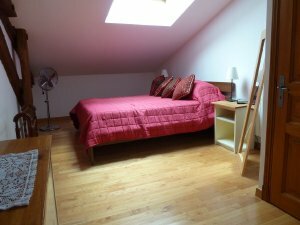 There are three bedrooms; a ground floor double bedroom with en-suite shower room and two further bedrooms upstairs (one with a double bed and one with two single beds) and a full bathroom. 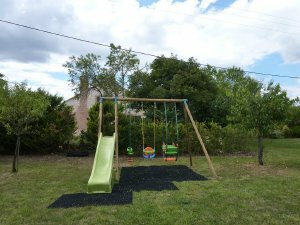 The Barn has been awarded a 4-Star classification by the Tarn Tourist Board (Comité Départemental du Tourisme du Tarn) for 6 people, although two additional children can be accommodated in the large twin bedroom with additional mattresses and a cot. The sitting room has a TV receiving French, UK and international satellite free-to-air channels, a DVD player and a basic hi-fi system. Wi-Fi is available in most of the property. There is a reasonable selection of English-language books for most tastes and some games, music and DVD’s. The kitchen has a 4-burner hob (stove), an electric oven and a microwave. It has a fridge/freezer and is fully equipped with cooking pots and pans for everyday life rather than just as a holiday home. A game-room between the house and barn contains a table football (foosball) and a small snooker/pool table. The main room in the Barn opens on to a spacious shaded terrace, facing west for the lovely sunsets, with large table and chairs for dining alfresco and for barbecues. 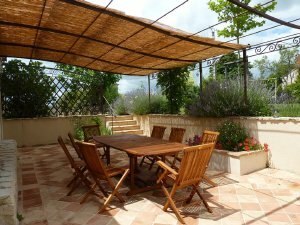 This terrace overlooks the landscaped garden of 2,500 square meters with grass, trees and shrubs, The utility room has a washing machine, ironing board and iron. There is also a tumble-dryer. The Barn has its own entrance and there is parking for 2 cars. 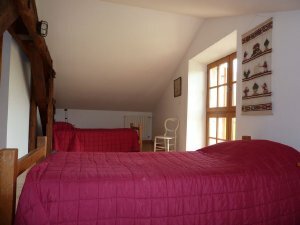 The property has full central heating and an open fireplace in the sitting room of the house. (To rent the House and the Barn together see the previous listing). Rates are shown in Euros (€). 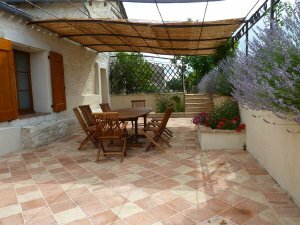 Rent is €1,200 per week in low season ranging to €1,450 per week depending on the time of year. Check-in is at 4PM and check-out is 10AM. Maximum occupancy is 8 persons. 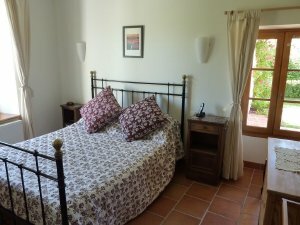 It is available outside the main holiday season, including at Christmas and New Year, when it can be booked for periods less than a full week. Tariffs for short lets are available on request.